One Momma Saving Money: Watch Your Dog's Waistline as the Weather Gets Cold! October 7th is National Pet Obesity Awareness Day! Watch Your Dog's Waistline as the Weather Gets Cold! October 7th is National Pet Obesity Awareness Day! Even with a very willing four-legged friend as a partner, cold weather can make it much tougher to get outside and be active. We don't want to be out in the snow, and neither does your pooch. We both just want to stay warm, so getting out and walking, playing in the yard, etc. happens less and less once the temperature drops. According to the Association for Pet Obesity and Prevention, more than half the dogs in the U.S. are overweight, and one out of five is obese. Also, October 7th is National Pet Obesity Awareness Day! Similar to how obesity impacts humans, excess weight on pets can result in a host of health problems, from an increased risk of osteoarthritis, joint problems, insulin resistance and type 2 diabetes, to high blood pressure, heart and respiratory disease, kidney disease, and some cancers. It can even decrease an animal's life expectancy by up to 2.5 years. 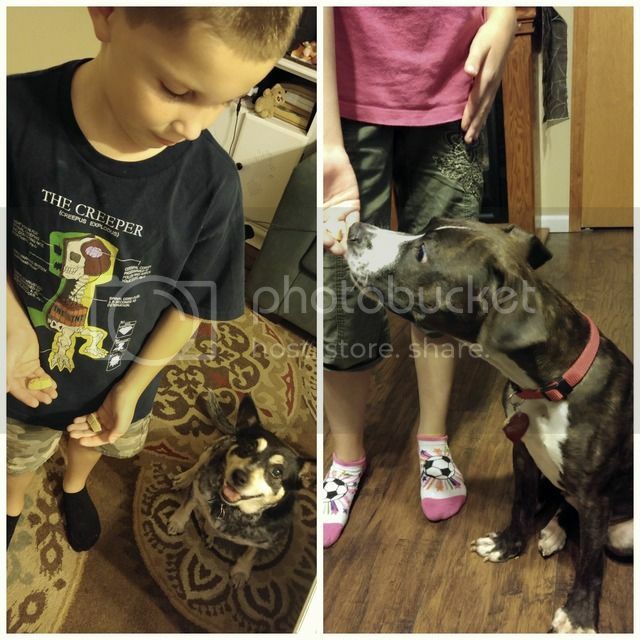 Well just like we enjoy a dessert every now and again, your pup enjoys treats too! Did you know there are low-calorie treats to help keep pup’s waistline trim during the fall and winter season? 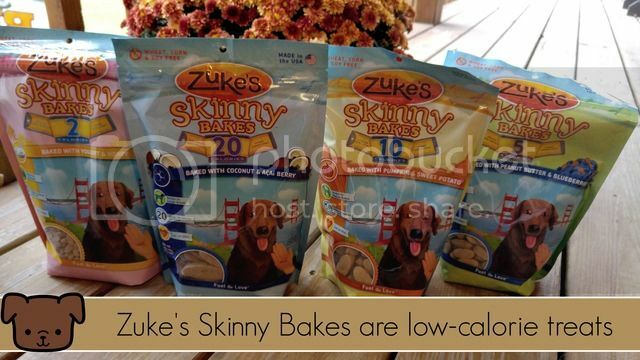 Zuke’s®, a natural pet treat company leading the way in pet nutrition, has expanded its lineup of crunchy 10-calorie Skinny Bakes® treats to include more low-calorie options with new 2, 5 and 20-calorie count varieties. 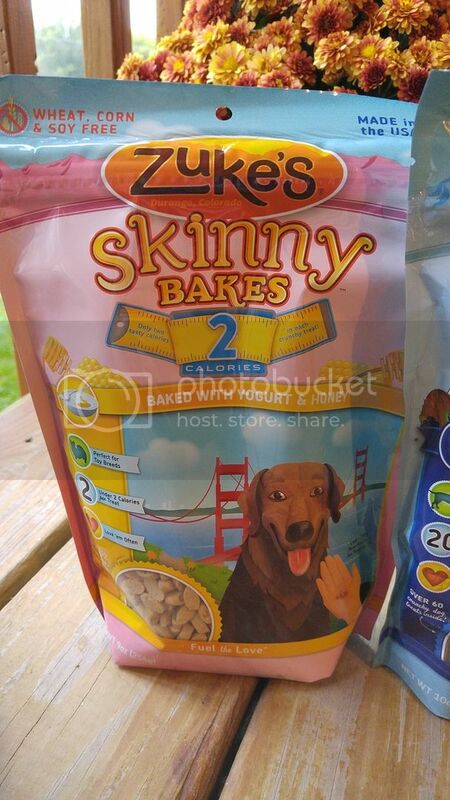 The perfect reward for a healthy dog looking to stay lean or for those wanting to get fit, Skinny Bakes® are made in the USA from natural, whole food ingredients that provide high-quality nutrition. The absence of wheat, corn and soy also makes this treat a good fit for dogs with common allergies. The two tiny calories in Skinny Bakes® 2s pack a nutritious punch. Brown rice, barley and rice bran plus the protein of yogurt are baked into every crunchy treat. Skinny Bakes® 2’s are perfect for toy breeds and for training puppies or larger dogs. Available in 3 yummy recipes: Yogurt & Honey, Yogurt & Maple Syrup, Yogurt & Vanilla. The five tiny calories in Skinny Bakes® 5’s pack a nutritious punch. Rolled oats, barley and rice bran, along with the goodness of peanut butter and wholefood fruits are baked into each treat. Skinny Bakes® 5’s are the perfect crunchy reward for small and large dogs alike. Available in 3 yummy recipes: Peanut Butter & Blueberries, Peanut Butter & Apples, Peanut Butter & Cranberries. At under 10 calories per treat, Skinny Bakes® 10’s pack a nutritious punch. Oatmeal, barley and rice bran are combined with wholefood fruits or vegetables. 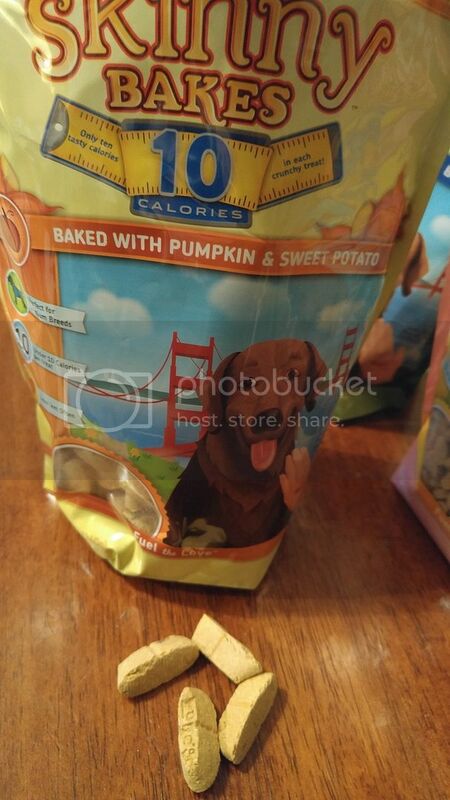 Skinny Bakes® 10’s are the perfect crunchy reward for medium-sized dogs. Available in 3 yummy recipes: Cherries & Berries, Peanut Butter & Banana, Pumpkin & Sweet Potato. At less than 20 calories per treat, Skinny Bakes® 20’s pack a nutritious punch. Brown rice, barley and rice bran plus the goodness of coconut and superfood berries are baked into each treat. Skinny Bakes® 20’s are the perfect crunchy reward for large-sized dogs or break them in half for smaller dogs. Available in 3 yummy recipes: Coconut & Acai, Coconut & Aronia Berry, Coconut & Pomegranate. Our older pooch has put on a few pounds since our other dog passed away. So of course when we got a puppy and was praising the puppy for going to the bathroom outside and giving her a treat, the other dog wanted one too. The 2 calorie treats are perfect for a puppy. Nice and small, but still tasty enough that both dogs enjoy them! Our newest puppy is a 6 month old boxer mix and she had a lot of health issues when we adopted her. She is now up to date on shots, gaining weight and no longer on antibiotics. We have noticed it seems she is itchy and scratches a lot, but there aren't any fleas. Seems to be an allergy. 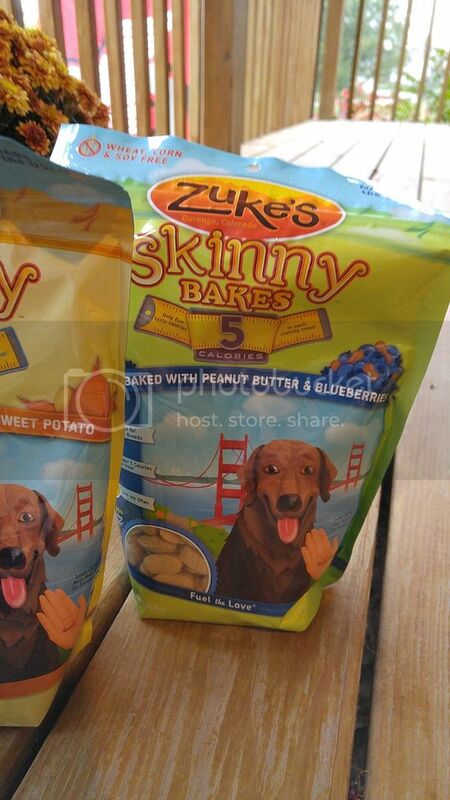 What makes Zukes perfect for her, these treats don't contain wheat, corn and soy which can be common allergies in dogs. These are the prefect training treats for puppies, treats for your slightly overweight dog or pooch with allergies! Each crunchy treat can easily break in half to provide twice as many rewards. Your dog will love them and may even give out extra kisses! 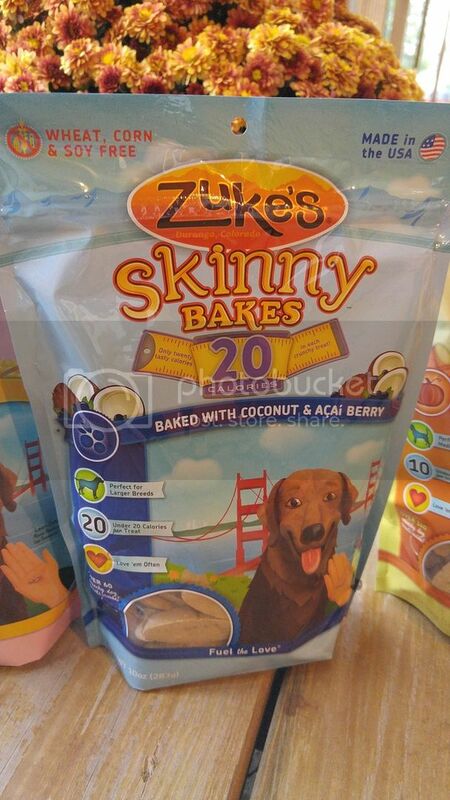 Zuke’s® new Skinny Bakes® varieties are available acroos the country at pet-supply chains, independent pet-product stores, natural-food retailers, and online for an MSRP of $6.99. Located in Durango, Colorado, Zuke’s® is a leader in the natural pet treat category. Named after founder Patrick Meiering’s beloved Labrador Retriever, Zuke’s® has been powered by passionate pet lovers for 20 years. The Zuke’s® team is driven by the joy that comes from exploring with their dogs and from the pursuit of a healthier life that makes pets and people happier. Creating treats with only the finest natural ingredients and no harsh additives or preservatives has been a priority at Zuke’s® since day one. All of Zuke’s® products, with the exception of the new Genuine Jerky featuring 100% grass-fed beef from New Zealand, are made in the USA. The company’s unwavering commitment to product purity and quality helped Zuke’s® become a successful, sustainable, and philanthropic business. Zuke’s® donates a portion of all sales to The Dog and Cat Cancer Fund (DCCF). For more information, visit www.zukes.com and learn more about pet nutrition at The Dog Blog. You can also find Zuke’s® on Facebook and Twitter.